Theatre Royal Wakefield01924 211311work TheatreTake your seats at the Theatre Royal Wakefield for a night you won’t forget! The beautiful Grade II* listed building was built by renowned architect Frank Matcham in 1894 and has been delighting audiences ever since. The theatre plays host to a variety of colourful and stirring performances from local amateur groups and national touring theatre companies, throughout the year. Whether it’s musical theatre, comedy, ballet, live bands or drama you enjoy, you’ll be sure to find something to love. 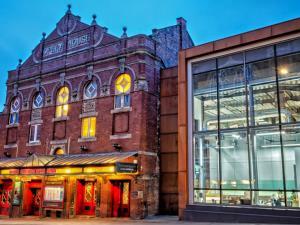 Take your seats at the Theatre Royal Wakefield for a night you won’t forget! So treat yourself to an evening of excitement and laughter at the Theatre Royal Wakefield, one of the jewels in Wakefield’s crown. Please see individual events for specific performance dates and times. Please see individual events for specific prices.